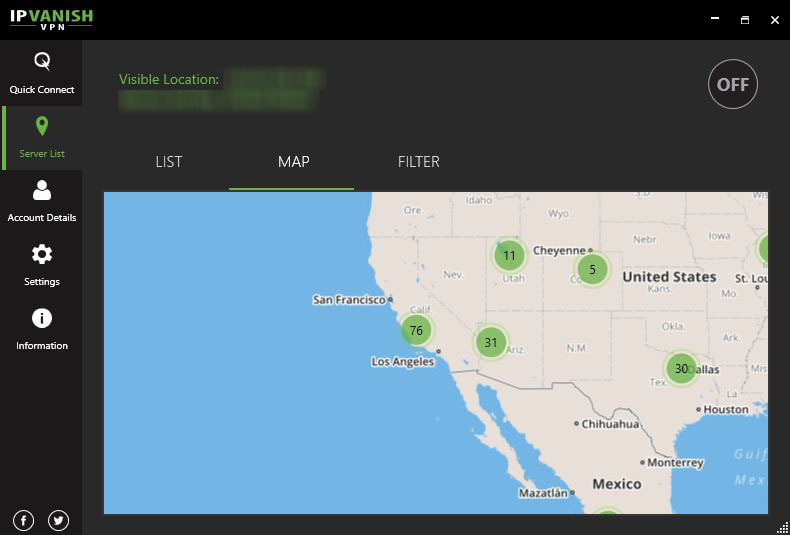 IPVanish VPN has been on the market for over 15 years now, with millions of users. So it has already proven itself. And it’s especially acclaimed by online players for his qualities : Extreme security (with a NAT firewall), first-rate speed and ease of use. All the performance features gamers are looking for. But is it the right VPN for you? Read this IPVAnish review to find out. As many other gamers, when I was looking to buy VPN UK, I turned to VPN Vanish in order to play some of my favourite online games (Counter Strike, Diablo and WoW among other). And if I’ve used it in the past, it was thanks to word of mouth. Unfortunately, I don’t have the time to play anymore. Because of my work and thanks to my family. But this is another story, let’s focus on the task at hand here: My IPVanish review. Some governments have banned online gaming (for real) with broadband filtering. And some internet cafés or hotels owners have decided to block the ports for certain types of traffic (for example, the ports used by online gamers), to save bandwidth. Also at home, chances are that your ADSL provider has set up blocks on your connexion, to restrict online gaming and torrenting. Fortunately, this provider is not only great for surfing anonymously, with the best encryption and protocols. It’s the best to access restricted game servers and to avoid the broadband limitations for P2P and torrents. And the performances are always optimal, with super fast servers and a tier 1 network – one of the fastest on the market. Lastly, the server load, like the ones in the UK, is still low. And to keep it that way, I’d be tempted to tell you not to spread the word. But keep it to yourself! IPVanish VPN offers a single package with all the features. And you can choose only the duration of the subscription: 1 month, 3 months or 1 year. All their plans are attractive in terms of pricing. And one of its strengths is the price of the monthly subscription, which is globally cheaper than the market price. So if you need a fast VPN for only a month, this is a serious option to consider. Of course, their 1 Year plan is their best deal. Because it offers the cheapest monthly price and about 50% discount. And no matter which plan you choose, you have the option to use IPVanish free for 7 days, with their money back guarantee. If you don’t like it, you can easily cancel the subscription and get a full refund. OpenVPN supported Support for SSL-based OpenVPN protocol cwith 256-bit data encryption. An important point of this IPVanish review concerns streaming. And especially Netflix. Well, if you’re looking for a VPN to unblock US Netflix, this is definitely not the right one. Because they’re focusing on security, gaming and download. And not on streaming. While you would technically be able to see Netflix, because it is a very good VPN, their servers’ IPs are blocked. And you can’t count on them to set up new ones. In my privacy ranking, this VPN has always been ranked at the top, with its strict zero logs policy. A no log policy means they don’t lot anything at all. In addition, the download of torrents is allowed. So you can use it to download and share Torrent or P2P files. But always keep in mind that you’re still responsible for any illegal activities in your country of residence. 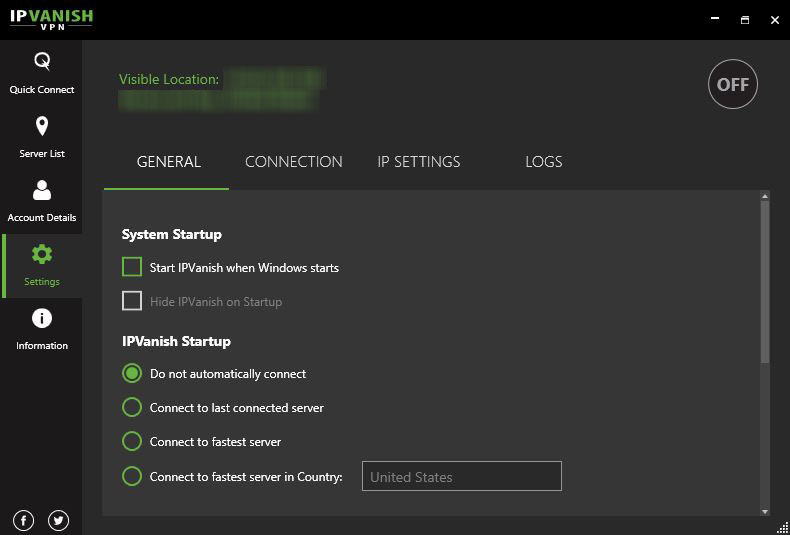 IPVanish VPN offers a Kill Switch on both PC and Mac clients. What is a kill switch? It’s a feature that blocks all Internet traffic when your VPN connection drops. And this allows you to maintain the protection of your privacy, even without the VPN. This is particularly interesting if you download torrents. Because if you keep downloading while your VPN is disconnected, you’re exposed. Indeed, your IP address is visible from all devices to which you’re connected. Your ISP automatically uses their own DNS servers when you connect to the Internet. Therefore, your internet Service Provider knows all your requests and your online activity… To improve your anonymity and reduce the level of censorship, you can change DNS servers. While you can use third-party DNS, like OpenDNS or Google DNS, VPN Vanish have their own DNS, for more security and less censorship. NAT Firewall protection is included in the subscription. And it blocks all malicious attempts to connect to your IP address. If you’re a competitive player, you know that opponents try to slow down your connection sometimes, with malware. But with VPN Vanish, one of the best VPN for gamers, got you covered. If you have a DNS leak, your device is sending requests from your real IP address, not inside the VPN tunnel. Fortunately, VPN Vanish’s software has built-in DNS leak protection. So you’re sure that all your traffic goes through the encrypted VPN tunnel. Last feature of this IPVanish review, a proxy. SOCKS5 is an extension of the SOCKS protocol, which supports advanced network technologies, such as UDP and IPv6. And a proxy server acts as an intermediary between your computer and the Internet, much like a VPN. But not encrypted… It can hide your IP address. But not your activity. Take advantage of this proxy to download faster. Choose the proxy to download your torrents safely (with the native encryption to the torrent client). And keep the VPN for all your traffic. That way you have the best performances! The interface is not really fancy, as you can see on my IPVanish review screenshots. And it looks like the client is in night mode! However, it’s much better than the previous versions. A menu on the left of the software allows you to interact with the application. And the dashboard has now disappeared for the benefit of Quick Connect. By clicking on connect, you’ll automatically connect to the fastest server. 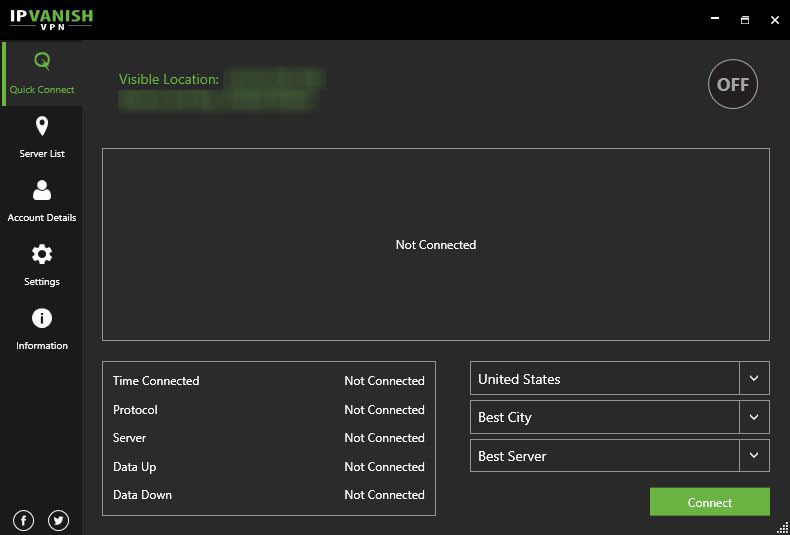 You can also access all servers from the Server List tab (who would have thought, right). First of all, there’s a list, which gives information on the number of servers per country, and the city they’re located. 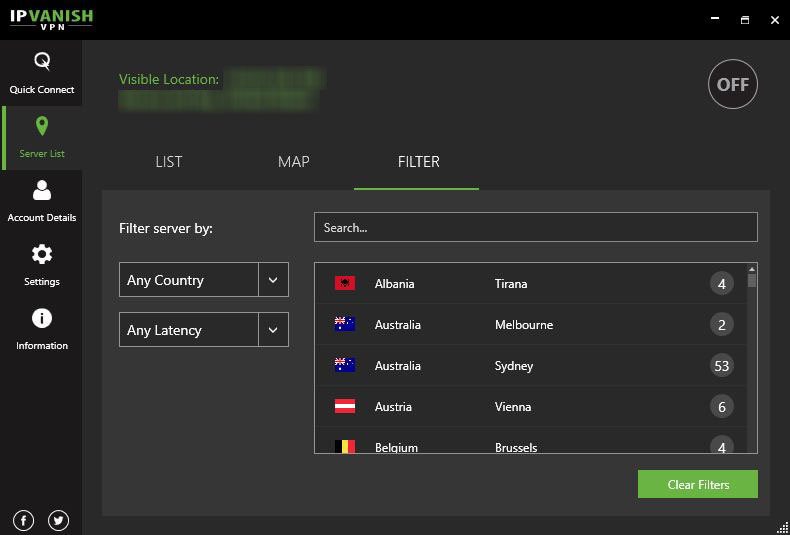 For convenience, you can select your favorite servers for a quick access. If you have a preference for graphics, the servers are available on a map. You can zoom in to see the servers in each country. For me it’s a bit of a gadget. But maybe you’ll like it! Finally, for an advanced search, click on the Filter tab. You can type the name of the city or country you are looking for. 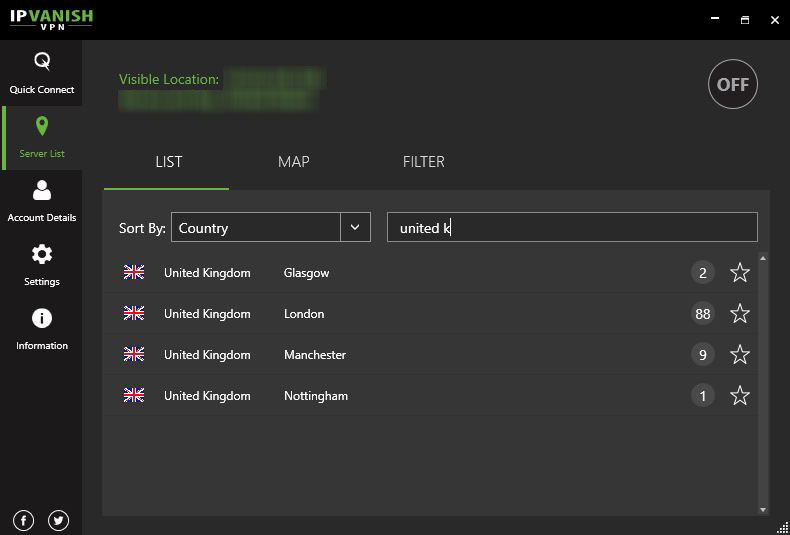 As well as filter results by country and by latency. Really convenient! The client used to handling everything automatically, without asking the user anything. But many options are now available. And that’s for the better. Indeed, no less than 3 tabs include all the options that such a VPN can offer. In addition to the standard options, such as Start when Windows starts and automatic connection, you can access the Betas. While it may be less stable, you could get new features before everybody else. 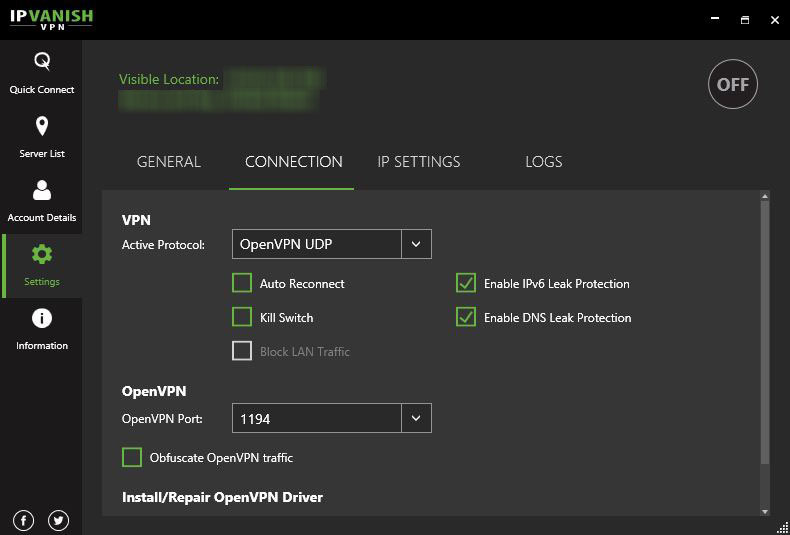 In the Connection tab, you can change the protocol to use for your VPN connection. I like the fact that the two types of DNS leak protections (IPv4 and IPv6) are there and enabled by default. Do not disable any of them! However, the Kill Switch is not enabled by default. So I’d tell you to enable it when you launch the client the first time. If you’re living or staying in a country with strong censorship, you can enable traffic obfuscation. And it will prevent deep packet inspection (DPI). That way you can surf freely, but it will be to the detriment of the speed. Over the years, the company has been improving their service and software. But they’ve removed the automatic change of IP address… And that’s too bad. Because it used to change the IP address automatically at a regular interval. Finally, as mentioned above, proprietary DNS servers are provided with each plan. But it is also possible to use third-party DNS servers. It’s good to have a choice! IPVanish has a native software available on almost each platform: PC (Windows, Mac), Smartphone (Android, iOS) tablets and Fire TV. While you could set it up manually, it’s more convenient with an app. And it brings extra features, like OpenVPN protocol. Most apps look the same. 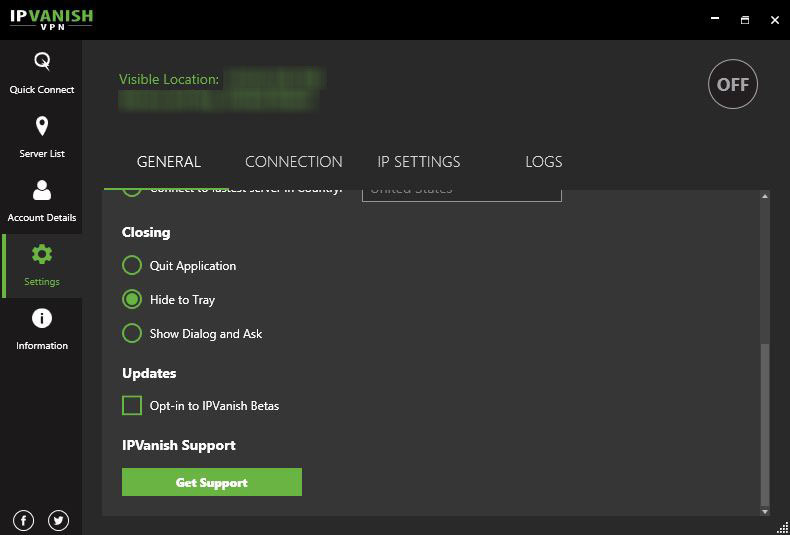 IPVanish is another great VPN solution. It is recommended for people who want to play online and need a high speed and secure connection. It is suitable for all those want to watch streaming and download torrents. However, it's not focused enough on streaming. And I can't recommend it for that use, especially if you want to watch Netflix. You'd better check other providers for this. 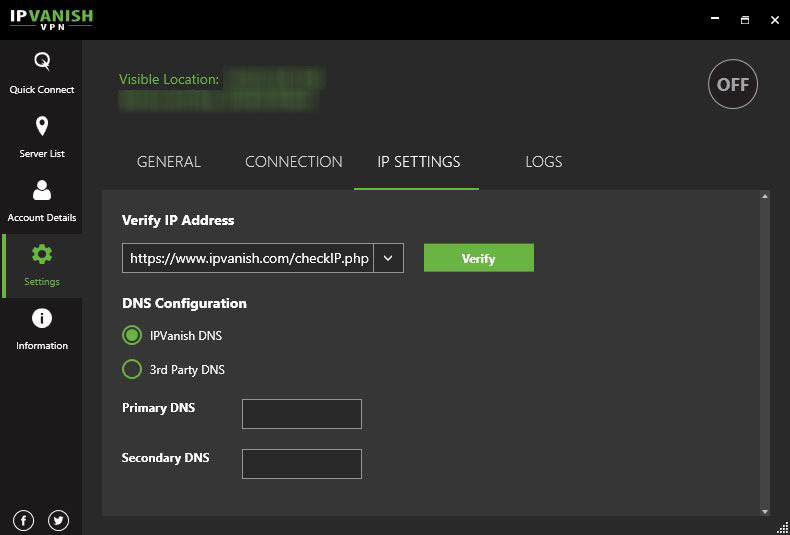 If you decide to select IPVanish VPN for all its features, you won't be disappointed. It offers high-end services with high-performance servers. All at an affordable price.